Peter Davis. Of the scores of musicians billed as “versatile,” Peter Davis may be most deserving of the accolade. Proficient on an astonishing variety of instruments, including clarinet, alto sax, 5-string & tenor banjo, piano, guitar, mandolin and whistle, Peter boasts an intuitive approach to all manner of traditional folk, blues, vintage pop and jazz forms. He currently plays with at least seven bands doing all kinds of gigs, from the ridiculous to the sublime, including concerts, festivals, schools, racetracks, weddings and private parties of all kinds. This versatile ensemble is known for their stellar renditions traditional and original folk, blues, swing, Western Swing and American and Celtic fiddle music. 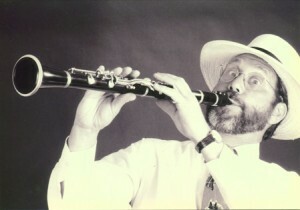 Peter has been associated with Jay Ungar and Molly Mason (www.jayandmolly.com) since 1989 and has performed with them in the house band on “A Prairie Home Companion,” in concerts at places like the Chautauqua Institution and the Rhythm and Roots Festival, and with people like David Bromberg and Natalie Merchant. Peter also teaches each summer at Jay and Molly’s Ashokan Fiddle & Dance Camp’s Western & Swing Week and is a regular performer and house band member on their monthly radio show “Dancing on the Air” (www.dancingontheair.com), heard on the 2nd Wednesday of each month on WAMC’s Northeast Public Radio Network. With Jay and Molly, Peter gets to do his entire multi-instrumentalist thing: piano, clarinet, alto sax, guitar, mandolin, 5 string banjo and vocals. Peter is heard on the Jay Ungar & Molly Mason Band’s most recent CD (2003), “Relax Your Mind”, on Angel Records. This remarkable trio specializes in school residencies in traditional music and dance. Peter, George Wilson and Paul Rosenberg, bring traditional music and dance to life with their Arts in Education Programs. Through their traditional community music and dance programs, children learn to love and respect our common heritage and to better understand and appreciate the traditions and cultures of people around the world. Peter is enjoying doing concerts with this great ensemble which features great jazz, blues and folk vocals by Annie Rosen and tight harmonies by the band. Purveyors of their own brand of groove based contradance fusion, Zydeco and original folk music, “The Clayfoot Strutters” play dance camps, concerts and festivals from Vermont to Alabama and from Alaska to Costa Rica! The personnel includes Peter on electric guitar, piano, clarinet and alto sax along with Pete Sutherland on fiddle, Jeremiah McLane on accordion and piano, Mark Roberts on banjo and flute, and Lee Blackwell on drums, guitar and vocals. This acoustic, strolling, traditional New Orleans Dixieland jazz band is the house band at Saratoga Racecourse each summer. Peter plays tenor banjo and sings his heart out. Fine fiddle and banjo music abound when “The Whippersnappers,” with George Wilson, Frank Orsini and Peter Davis, perform their joyfully eclectic repertoire of old time music, from the rollicking banjo songs of Uncle Dave Macon, to Leadbelly’s 12-string guitar blues, to driving double fiddle tunes and haunting Shetland airs. Peter is heard on guitar, piano and vocals.